YOU PLAN ON LOVING YOUR DOG FOR YEARS, RIGHT? IF SO, PLEASE INVEST AN HOUR OF YOUR TIME TO READ THIS PAGE. IT IS WORTH IT! Here at Starstruck Labradors, we have dedicated innumerable hours to studying and learning about the genetic component of breeding. 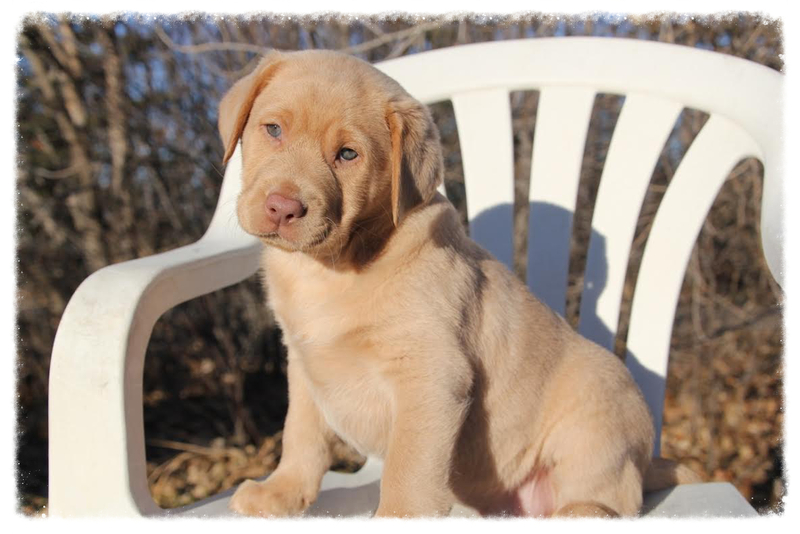 We ask ourselves; "What can we do, as breeders, to reduce inherent genetic weaknesses in the Labrador Retriever?" Why don't all breeders do genetic health testing? Bottom line: these tests cost a lot of money, and exclude a lot of dogs from breeding programs. A GOOD breeder will know the genetic make up of EACH of their dogs. Genetic testing is THE ONLY WAY to build better and healthier dogs! Eyes - All our breeding stock, male and female, have passed CERF examinations. CERF is a general eye exam by a veterinary ophthalmologist (specialist) who examines the eye for any heritable eye diseases. Hearts - Our breeding dogs also have cardiac testing, which means that our Vet has listened to the heart, and makes note if there are any murmurs, etc. If an issue does arise, we can take the dog for further testing with a cardiologist. The heart has conventionally not been a major problem in labs, but we have begun testing for it regardless during our usual testing protocols. Hips - There are different ratings for canine hips: Excellent, Good, and Fair are all “normal” ratings. The next is a Borderline hip rating, followed by three degrees of dysplasia: Mild, Moderate, and Severe. We x-ray the hip and elbow joints of all our breeding dogs to check for abnormalities, whether by injury or genetics. However, that does not mean we only breed the perfect dogs together. As the diseases of hip dysplasia and elbow dysplasia are influenced by a number of genes and environmental factors, it is not an exact science. It is always best to breed "perfect" quality dogs together, who have excellent hip joints, normal elbows, flawless eyes, and no health issues of any other type. But in the real world, keeping to the excellent categories would serve only to irreversibly diminish the Labrador gene pool. Furthermore, the quality of joints of the siblings, parents, aunts, and uncles of the dog in question can be as important as those of the dog itself. The statistics published by the OFFA show that breeding two dogs with "Good" hips together would produce 10% dysplastic offspring. Breeding two dogs with "Fair" hips produces 20% dysplastic offspring, while breeding a dog with "Excellent" hips to a dog with "Fair" hips produces 10% dysplastic pups as well. However, very few of these dogs will ever limp, or show any clinical signs of dysplasia until their senior years, if at all. Regardless, by the time any canine reaches the age 8-10 years, many signs of aging can be present. Elbows - In comparison, while hips are rated "Excellent," "Good," "Fair," "Borderline," or different grades of dysplastic, elbows are rated only as "Normal" (Perfect), and then different grades of dysplastic. So although a few of our great quality dogs have sub-clinical Grade 1 dysplasias (the lowest grade), no one actually shows any outward signs of dysplasia. Again, this is a matter of constant improvement. As a breeder, we must always know who we are breeding to whom so that the line is improved, and the pups are of equal or better quality than their parents. If we disqualified all of the dogs with the slightest elbow issue, we would lose 31% of the breeding population in every generation, compounding a genepool problem that is historically present in purebred dogs, and far more dangerous to the dogs than any heritable disease. These statistics are huge studies based on up to 500,000 or so dogs of all different breeds. There is nothing specific to show-type Labradors, field-type Labradors, etc. All of these statistics also reflect clinical and sub-clinical dysplasias. ‘Clinical’ would be a dog who is actually lame. ‘Subclinical’ is a diagnosis of dysplasia based on poor joint conformation from x-rays. While we are always concerned about subclinical dysplasias in breeding, we don't warranty unless there is a clinical problem, as there are many dogs with now symptoms who are happily enjoying life with less than stellar joints. DNA - As a Starstruck Policy, we test all of our breeding dogs for genetic diseases. These are simple recessive diseases in labrador retrievers, which means that both parents must carry a mutated gene in order to create offspring who are affected by the disease. It is impossible for any of our puppies to exhibit these problems, because we always ensure that one of the parents is Clear for all mutated genes of the diseases. The four following tests (Progressive Retinal Atrophy (PRA), Centro-Nuclear Myopathy (CNM), Degenerative Myelopathy (DM), Exercise Induced Collapse (EIC)) are all tested via oral swabs, and set to a laboratory for analysis. To test for all of these diseases, we use Pawprint Genetics and DDC Veterinary. PRA- Progressive Retinal Atrophy, more commonly known as PRA, is a general term for a group of diseases causing degeneration of the retina, leading to a loss of vision. 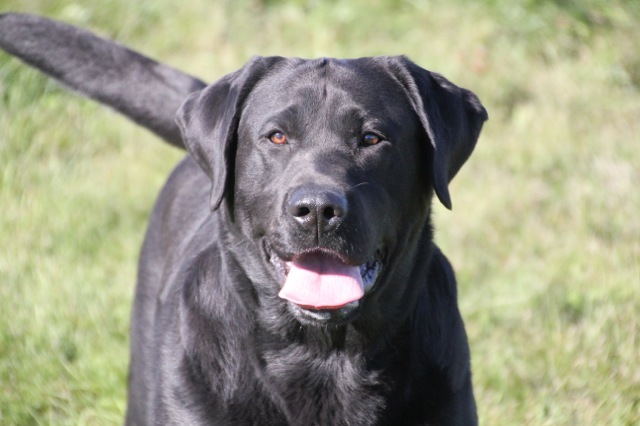 The most common form of this disorder in Labradors is PRA-prcd (Progressive Rod-Cone Degeneration). This leads first to the loss of night vision, and then to complete blindness of the dog, with the typical onset is between 3-5 years of age. Select the "Play" button on the video below to learn more about how PRA affects Labrador Retrievers. We guarantee all of our puppies against this disorder for LIFE! CNM- Puppies are born apparently normal; however, it quickly becomes evident that there is a problem. The puppy will often not gain weight adequately, due to decreased muscle tone in the esophagus. Within 2 to 5 months, the disease has usually progressed to display the full range of symptoms, including a loss of muscle tone and control, an awkward gait, and extreme exercise intolerance. This condition is exacerbated in cold conditions. Unfortunately, there is no cure for CNM, as the dog will never develop properly functioning muscle tissue. The dog usually has a normal life span, however, he will always be plagued with the symptoms of Centronuclear Myopathy. Select the "Play" button on the videos below to learn more about how CNM effects Labrador Retrievers. We guarantee all of our puppies against this disorder for LIFE! DM- Degenerative Myelopathy is a progressive disease, meaning that dogs get slowly weaker and weaker over a a period of time following the onset of symptoms. Degenerative myelopathy usually affects the hind legs first, but muscle weakness can spread to the front legs as well. Dogs with degenerative myelopathy may begin to stumble frequently as they become progressively weaker due to nerve damage. Eventually, dogs with degenerative myelopathy will lose control of their bladder and bowels. As the disease moves into its final stages, symptoms of weakness, trembling and stumbling will begin to affect the front legs as well. Click the "Play" button on the videos below to learn more about how DM affects Labrador Retrievers. We guarantee all of our puppies against this disorder for LIFE! EIC- Exercise-Induced Collapse is a devastating genetic disorder causing affected dogs to suffer from a loss of muscle control following periods of extreme exercise. This disorder is caused by a mutation in the Dyamin 1 gene. Because EIC is a recessive disorder, a dog must have two copies of the mutation (one from each parent) in order for the disease to manifest itself. Typically, an affected dog begins to show symptoms between 5 months and 3 years of age. The dog can live a happy life as a sedentary pet, but in severe cases, is sometimes euthanized for humane reasons. Select the "Play" button on the video below to learn more about how EIC effects Labrador Retrievers. We guarantee all of our puppies against this disorder for LIFE! of our dogs to warranty them if they ever do develop a genetic condition. We hope you feel enlightened! We have done our best in action and study to actively breed for a better Labrador! Although there is no such thing as a "perfect" Lab, there is a possibility that the genetic strengths of a breeding pair can complement each other, making a foundation for a healthier future. We hope you have enjoyed our summary of the genetic component to our breeding program. Please feel free to ask any questions that you may have in addition to this information! Help us in the fight against poor breeding, resulting in ill and suffering puppies - Please do not buy a puppy from a breeder who doesn't spend the time and money to test their breeding stock for all of the above conditions. If you can read this page, and understand the importance of a well-bred dog, then breeders can too!